Puma wrapped up 2018 by reporting significant earnings gains in the fourth quarter on a 20.1 percent revenue gain. For 2019, Puma expects earnings to climb 23 percent on a 10 percent sales increase. 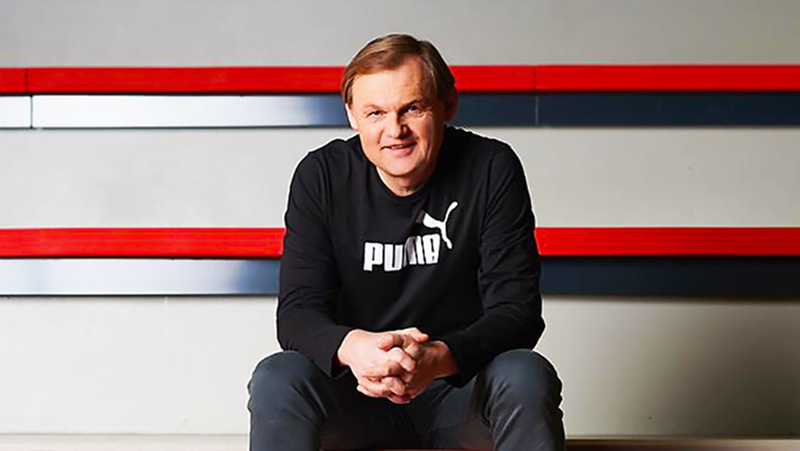 Bjørn Gulden, the CEO of Puma SE, said, “We are very happy with how our business developed in 2018. Sales rose organically by 17.6 percent to €4,648 million and the operating result (Ebit) improved by 37.9 percent to €337 million, which shows our strong momentum. The double-digit growth in all regions is proof that we have strengthened the Puma brand globally and the double-digit growth in all product divisions shows that we have enhanced our product portfolio.We still have a lot to improve, but we feel we are moving our brand and company in a good direction. We see that our progress will also continue in 2019 and expect our currency adjusted sales to grow around 10 percent and our operating results to increase to a range between €395 million and €415 million. Puma’s sales growth continued in the fourth quarter of 2018. Sales increased by 20.1 percent currency adjusted to €1,226.4 million (+17.9 percent reported), compared to €1,040.2 million in the previous year. Sales growth was particularly strong in the Asia/Pacific region followed by the Americas, both increasing at double-digit rates. Both Apparel and Footwear showed strong growth in the fourth quarter of 2018, improving 28.6 percent and 17.4 percent respectively. For Footwear, it was the 18th consecutive quarter of sales growth. The gross profit margin in the fourth quarter remained stable at a high level of 47.1 percent, despite negative currency impacts in the quarter.Operating expenses (OPEX) rose by 17.1 percent to €544.9 million in the fourth quarter, caused by higher sales-related, variable costs and a step-up in retail investments, including e-commerce. Football sponsorships, marketing initiatives for new footwear franchises and the launch of the basketball category led to higher marketing costs. The operating result (EBIT) improved by 26.1 percent from €29.8 million to €37.6 million in the fourth quarter of 2018. The improvement in profitability was due to the strong sales growth combined with an OPEX increase at a slightly lower rate than sales. Net earnings in the fourth quarter of 2018 improved significantly from €2.2 million last year to €15.7 million and earnings per share increased correspondingly from €0.14 last year to €1.05. In the financial year 2018, Puma’s sales increased by 17.6 percent currency adjusted to €4,648.3 million (+12.4 percent reported). The significant difference between reported and currency-adjusted sales growth was due to the weakness of several major currencies against the Euro. In the EMEA region, sales rose by 11.4 percent currency adjusted to €1,800.3 million (+9.4 percent reported). The main growth drivers in the region were France, Spain, the United Kingdom as well as Russia and Turkey, which all posted double-digit sales growth. Sales in the Americas region went up by 16.9 percent currency adjusted to €1,612.5 million (+7.9 percent reported), with both North and Latin America contributing double-digit growth rates. The weakness of the Argentinian Peso against the Euro, however, led to the significant negative currency impact in the region. Growth was strong in the Asia/Pacific (APAC)region, where currency-adjusted sales rose by 28.8 percent (reported +24.2 percent), mainly driven by high growth in China and Korea, while sales in Japan increased at a more moderate mid to high single-digit rate. Footwear continued to be a strong sales driver throughout the year. Sales were up 16.6 percent currency adjusted to €2,184.7 million (+10.6 percent reported), exceeding the €2 billion sales mark for the first time. Running and Training as well as Sportstyle were the categories with the strongest growth rates. In the Apparel segment, sales rose by 22.2 percent currency adjusted to €1,687.5 million (+17.1 percent reported). Logo-driven apparel within our Sportstyle category and new product launches in the Teamsport and Motorsport categories contributed to this increase. Accessories sales grew by 11.0 percent currency adjusted to €776.1 million (+7.8 percent reported). This increase was mainly driven by higher sales of legwear and bodywear products. Including e-commerce, Puma’s retail sales increased by 24.0 percent currency-adjusted to €1.127,5 million. This represents a share of 24.3 percent of total sales in 2018 (2017: 23.2 percent). Like-for-like sales growth in our retail stores, the extension of our retail store network as well as the extensive growth of our e-commerce business contributed to this rise. The gross profit margin improved by 110 basis points from 47.3 percent to 48.4 percent in 2018. This increase was mainly driven by further improvements in sourcing and higher sales of new products with a higher margin. In addition, a higher share of own retail sales and the regional sales mix with stronger growth in Asia had a slight positive effect on the gross profit margin development as well. There were no full-year currency effects on the gross profit margin compared with the previous year, as positive and negative effects during the year canceled each other out on a full-year basis. The gross profit margin in the Footwear segment improved by 30 basis points to 45.8 percent. In Apparel, margins rose from 49.0 percent to 50.9 percent and Accessories margins increased from 48.5 percent to 50.3 percent in 2018. Operating expenses (OPEX) rose by 11.8 percent and amounted to €1,928.4 million in 2018. Intensified marketing activities, the refurbishment, an extension of our own retail store network, including our e-commerce business as well as further investments into our IT-infrastructure have led to this increase. The OPEX ratio in percentage of total sales decreased from 41.7 percent in 2017 to 41.5 percent in 2018. This reflects operating leverage and contributes to the improvement of profitability in 2018. The operating result (EBIT) improved significantly by 37.9 percent from €244.6 million to €337.4 million in 2018, which was slightly above the upper end of the revised EBIT guidance of a range between €325 million and €335 million. This development reflects the improvement of Puma’s profitability and was achieved through strong sales growth combined with a higher gross profit margin as well as operating leverage. As a result, the EBIT margin went up from 5.9 percent in 2017 to 7.3 percent in 2018. The financial result decreased from €-13.4 million in 2017 to €-24.0 million and was mainly impacted by higher expenses related to currency conversion differences. The tax rate for the full year 2018 amounted to a slightly lower rate of 26.7 percent compared to 27.4 percent last year, while the total tax expense increased to €83.6 million in 2018 (2017: €63.3 million). Net earnings increased by 38.0 percent from €135.8 million last year to €187.4 million in 2018. This translates into improved earnings per share of €12.54 compared to €9.09 last year. Despite a significant increase in sales and an increased number of own retail stores, working capital rose only slightly by 2.0 percent from €493.9 million to €503.9 million in 2018. Inventories grew by 17.5 percent to €915.1 million mainly related to the planned sales growth from the 2019 spring/summer collection. Trade receivables rose by 9.9 percent from €503.7 to €553.7 million. On the liabilities side, trade payables and other current liabilities increased by 21.0 percent to a total of €1,152.6 million (last year: total of 952.2 million). The free cash flow improved from €128.5 million in 2017 to €172.9 million in 2018. This development was a result of considerably higher earnings before taxes (EBT) and the only moderate increase in working capital. As of December 31, 2018, Puma’s cash position amounted to €463.7 million compared to €415.0 million at the balance sheet date last year. Based on Puma’s positive business development in 2018 with an improvement of profitability and cash flow, the Management Board and the Supervisory Board of Puma SE will propose to the Annual General Meeting on April18, 2019, a dividend of €3.50 per share for the financial year 2018. This represents a payout ratio of 27.9 percent as a percentage of net earnings, in line with Puma SE’s dividend policy, which foresees a payout ratio of 25 percent to 35 percent. Our business developed strongly in 2018, both in terms of net sales and profitability. We are confident that the positive development will continue in 2019. For the full year 2019, we expect currency-adjusted sales growth of around 10 percent. We forecast the gross profit margin to show a slight improvement compared to last year (2018: 48.4 percent) and operating expenses (OPEX) to increase at a slightly lower rate than sales. Based on the current exchange rate levels, management expects an operating result (EBIT) for the financial year 2019 in a range between €395 million and €415 million (2018: €337.4 million). Management also expects a significant improvement in net earnings in 2019. With that, Puma is well on track towards achieving our medium-term ambition of 10 percent EBIT margin by 2021/22 with average annual sales growth of 10 percent in constant currency. The new accounting standard relating to lease accounting (IFRS 16), which has been effective since January 1, 2019, leads to capitalization of the operating leases on the balance sheet (an increase of approximately €618 million in assets and liabilities on January 1st, 2019). The outlook for the operating result (EBIT) in a range of €395 million to €415 million (see above) includes a positive effect of approximately €16 million caused by the new accounting standard. Taking into account interest and deferred tax effects of IFRS 16, the estimated impact on net earnings in 2019 is, however, a negative amount of approximately €7 million. PreviousCan ‘Bench Strength’ Bolster REI During Leadership Transition?